It starts with convenience and familiarity. The lousy leader is known to you; charming and fun to be around, or they may have helped you during tough times, so you feel indebted. Soon, they want you to do special favors for them. They are acts you don’t feel comfortable doing, but you quickly talk yourself into them because you don’t want to cause disappointment. In a confounding mental game, you warp the “get out of your comfort zone” mantra, into betraying your value; a destructive choice that becomes easier with repetition. Next, you also begin to betray old friendships, convinced that people are holding you back, are unsupportive, or have an agenda. Caring about you isn’t a strong enough reason, because you are now surrounded by others who tell you that caring is a weakness that prevents you from making real money. Ironically, conversations with your new “friends” likely occur over bottomless early-afternoon drinks; their wisdom spewed between slurred speech and bursts of drunken laughter. You pick up the tab because you appreciate the insights and attention. In time, you achieve a few financial successes, but it’s not enough. You’re in a hole, so it doesn’t feel like progress. You’re impatient instead of disciplined; your ambition morphs into greed. You are less flexible, more opportunistic. Everything. Ev-er-y-thing, is about making a buck or increasing your power. Connections to your past dwindle until only one item remains. Like Citizen Kane’s “Rosebud,” you have a sole touchstone that reveals your true self; a piece of jewelry, a book, a beloved pet, or an old set of tools. Eventually, it too disappears, and you mourn, not for the loss of the item, for the loss of your inner goodness and the direction you could have taken but choose not to. It’s at this hour that your transformation is complete. You fully embrace the ease and cowardliness of lousy leadership because you believe you’re too far down the path and cannot return. It’s thought that the potential to save thousands of lives is what motivates some medical professions and researchers. More often it’s about the one they couldn’t. Someone very dear to them, who despite all effort, perished too soon. In my work helping people to become better leaders, I sometimes encounter those who reject the term, leadership. Their belief system won’t allow them to step up, face the burdens, nor accept the responsibility. It’s disappointing, but reluctant leadership can be as equally harmful as lousy leaders, so, perhaps it’s for the best. No, the heart-wrenching tragedy occurs when someone with a powerful, servant leadership mentality, warm heart and giving spirit, repeatedly allows themselves to be taken advantage of by lousy leaders. While it’s difficult to see those you care about flounder in any abusive or highly leveraged relationship; it’s unbearable to see them slowly grow blind to the impact of their decisions. Incapable of breaking a destructive pattern, frenetic momentum builds until they suddenly become lousy leaders themselves. When they cross that Rubicon, there is nothing more I can do. I sob for the loss, and for the knowledge that a new adversary is born. Despite the pain that accompanies this rare event, it reinforces my mission to disrupt, dismantle, and diminish the negative influence of lousy leaders. 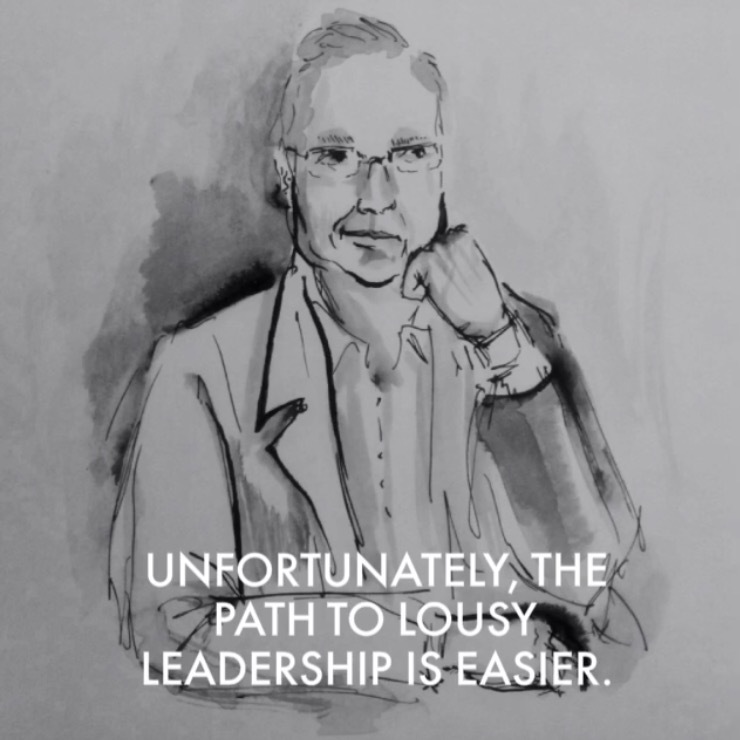 Becoming a lousy leader is easy. Please resist the temptation least we meet in unfavorable conditions.